For this Mother’s Day I wanted to dedicate this post to my mom. She is an amazing, smart, strong, beautiful, hard-working, loving, and resilient woman. I like to think (and hope) that I inherited all of those beautiful qualities from her. 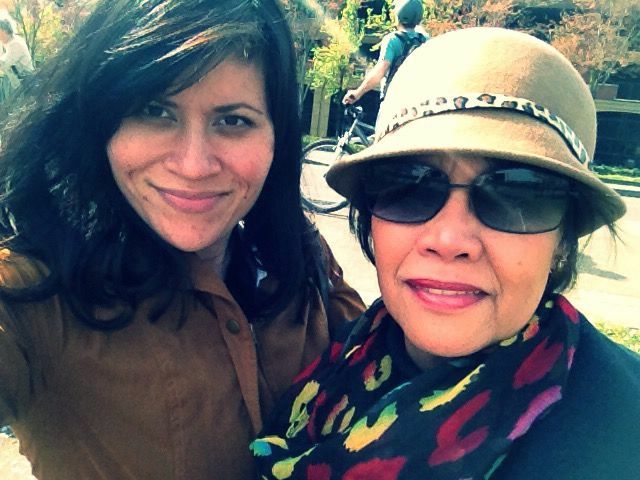 Happy Mother’s Day, mama! Unlike me, my mom is very particular when it comes to sweets. She loves desserts with fruit, whereas I love rich desserts with chocolate. Remember this post? 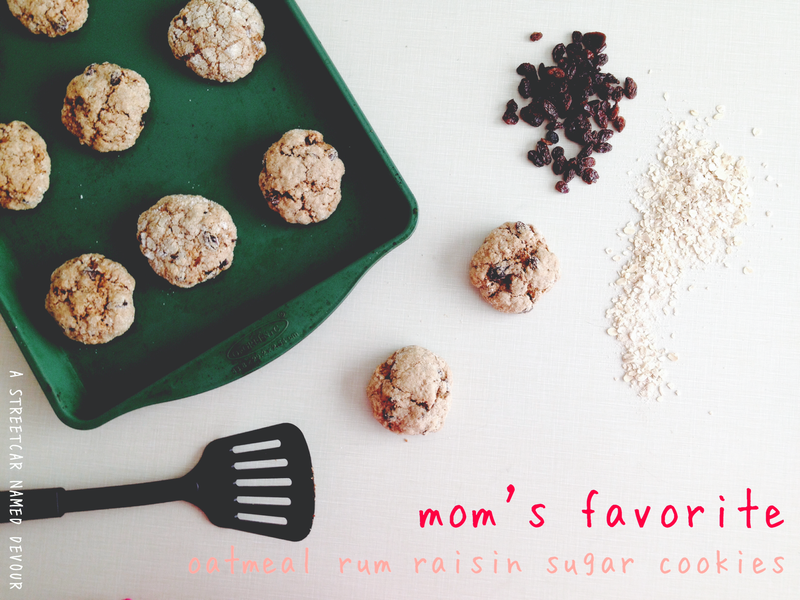 But one of the desserts my mom and me can agree on are Oatmeal Raisin Cookies. They’re her favorite cookie because they have a form of fruit in them, I imagine. So when my parents came up to visit me a couple months ago, I asked my mom what kind of snack she wanted me to make for their trip back home. 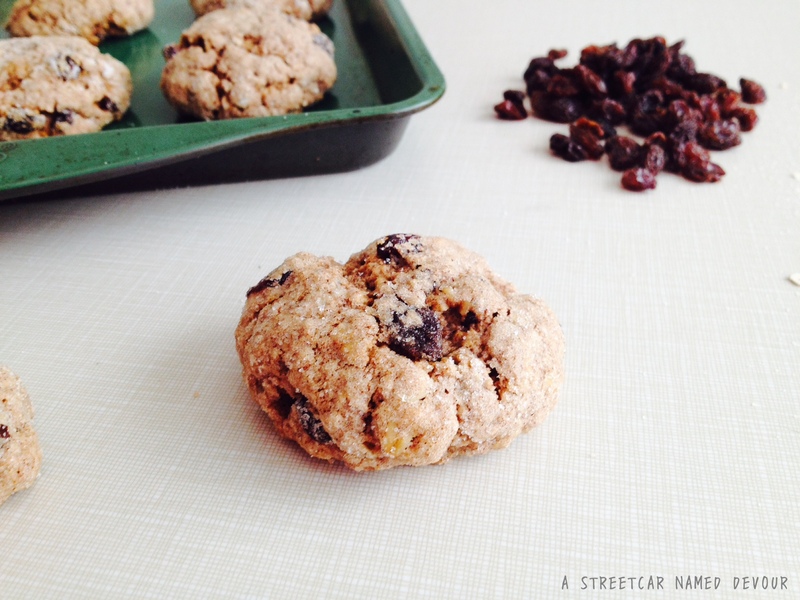 She mentioned oatmeal raisin cookies, so I put this recipe together that I thought she would love. I had a bottle of rum on hand from a rum cake recipe I always make for her, and decided to use it to rehydrate the raisins. I love the rich, caramel-like flavor the rum gives after they’ve been soaking with the raisins, so I added them to the dough. The recipe isn’t too sweet, so I also rolled the dough in sugar to create a pretty sugary crust. 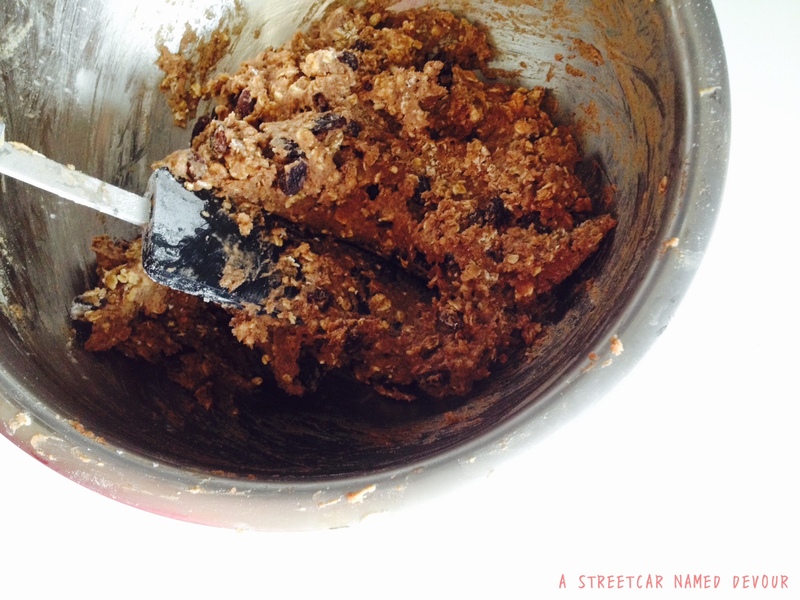 The end result is a not-too-sweet, spicy, (a bit boozy) oatmeal raisin cookie with a great depth of flavor. Snacks intended for their voyage back home, my parents confessed to me that the cookies were all gone way before they even got home. Apparently, my dad was a fan of them, too! 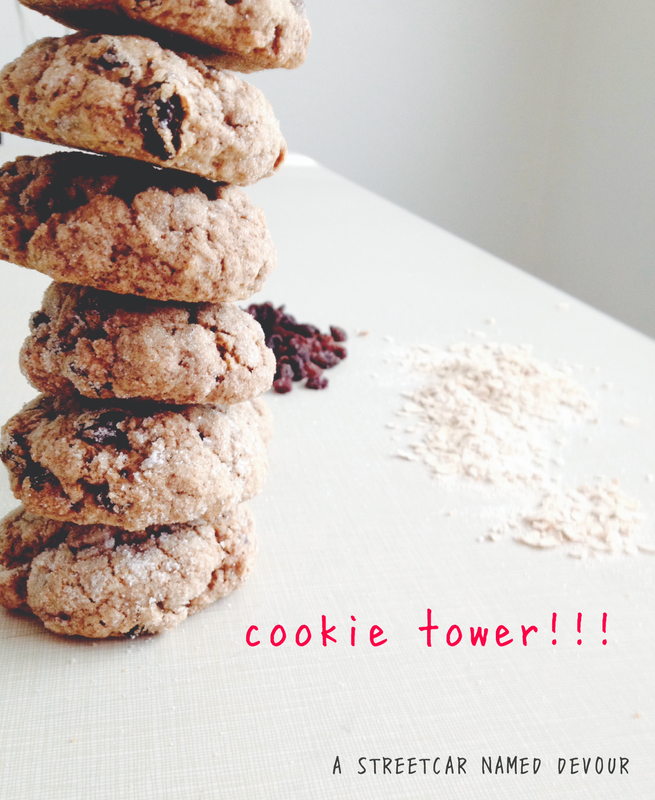 What are your favorite cookie flavors? 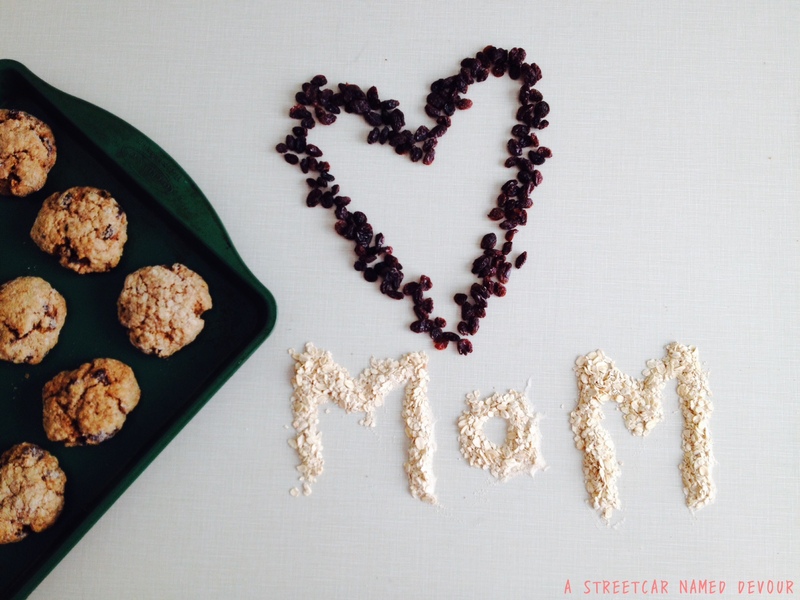 What recipe reminds you most of your mom? Share your stories in the comments below; I’d love to read them! To rehydrate the raisins, place them into a small bowl and pour the rum into the bowl. The raisins should be completely immersed in the liquid. Add more if needed. Set aside. Using a stand mixer, cream together the butter and sugars on medium-speed till incorporated. Add the egg and vanilla and mix till combined. Drain the excess rum from the rehydrated raisins, reserving the rum. Set raisins aside. Fold in the rum into the mixture. Use a rubber spatula to scrape down the sides of the bowl to ensure all ingredients are mixed well. In a separate bowl, mix together the flour, baking soda, spices, salt, and rolled oats. Slowly add the flour mixture into the sugar/butter mixture on low till just combined. (Don’t over-mix.) 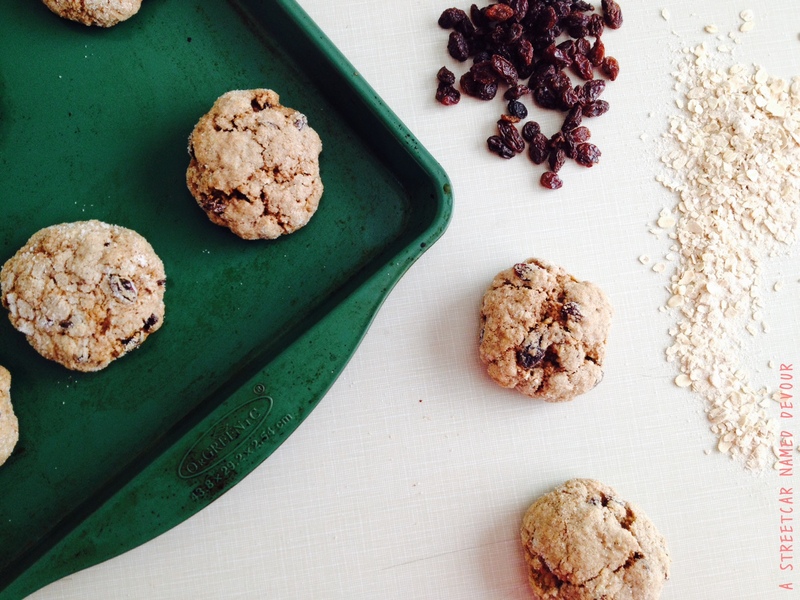 Fold in the rehydrated raisins to the dough. The dough will be slightly sticky—that’s OK. While your dough chills, preheat your oven to 350F degrees. Place about a half-cup of sugar into a small bowl. Set aside. Roll a small ice cream scoopful (or 2 Tablespoonfuls) of dough and place into the bowl of sugar and fully coat the cookie ball. 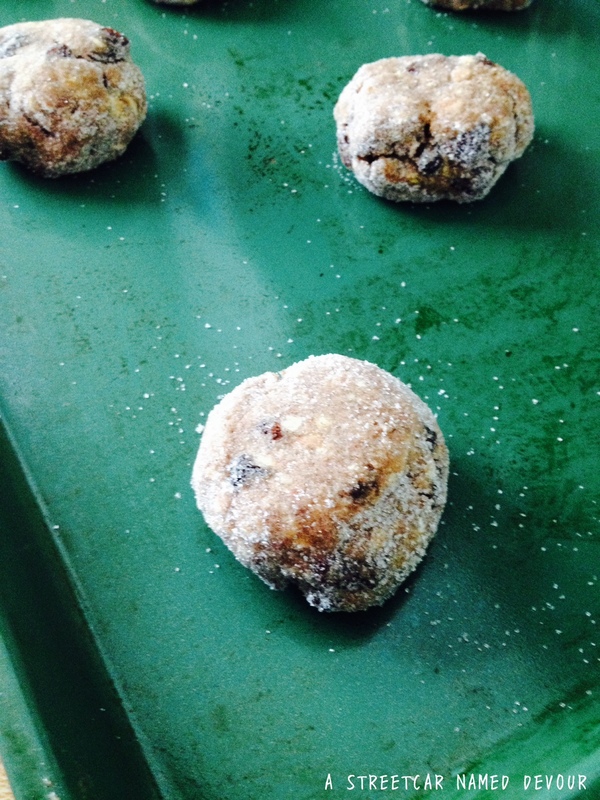 Place the dough ball onto the sheet tray, leaving about 2 1/2 inches of space between each cookie. Bake for about 14-17 minutes or until lightly browned on the edges. When done, remove from the oven and allow to cool for about 10 minutes.